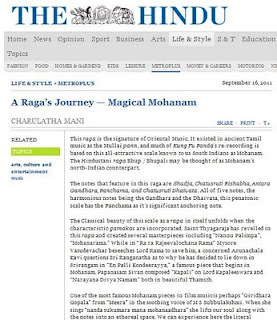 Hi Charulatha, just to say that my mother was very impressed about an article you wrote in the Hindu on Mohanam. I'm waiting to read it. I am familiar only with the Illayaraja and A R Rehman compositions. Going by those songs, this raaga should be beautiful! What a mellifluous voice you are gifted with. Please inform me when you will be coming to Mumbai for performing Isai Payanam, Abhang, etc. I am one of your Rasikas. My age is only 73 years. I have heard several of your programmes between 2005 and 2009 at Chennai. Not only that, I got certificate and prize from you for one of the quizzes organised in an 'Isai Payanam'. All the best for the events to be held this month and in October. Today's Devi Darshanam concert was Excellent. Especially Amrutha Varshini & Kalyani were great. Selection of songs was nice, mixture of different languages, composers etc. We enjoyed your command on presentation, lay, bhava. Explanation before songs is a good innovation. I wish to contribute a small value. Please email me details. I thank you all for the nice work done. this navaratri i am blessed by hearing the songs of gomathi amman. i would like to thank once again for this . oh my - how blessed! you sing so beautifully.. precious. gifted. heaven.